Our stock list is up-to-date. We are now retired from commercial sea kayaking. We are selling our remaining stock of clothing and equipment at greatly reduced prices. We will occasionally do boat repairs if you need them and could be persuaded to make an occasional Greenland paddle. We're selling our stock of sea kayaking clothing, DVD's, books, paddles, tow ropes etc. Click here to see the up-to-date list. While we are delighted to now be in lovely North Leitrim, we're going to miss all our Dublin customers with whom we enjoyed so many happy and challenging days. If you're going to sea, do make sure you're with qualified instructors. 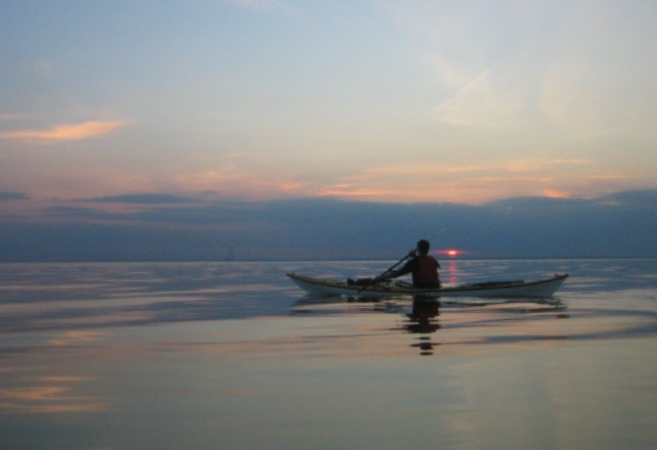 Only properly qualified SEA kayaking instructors can take you out on the open ocean. More info here. Be safe and enjoy. Where the land meets the sea is a wonderful environment. Returning from Dalkey at sunset.